Du durchsuchst gerade das Archiv des Tags ‘Sylt’. Man denkt, wenn man oft an die gleichen Orte reist, dass sich alles wiederhole, und die Vertrautheit der vorherrschende Antrieb ist. 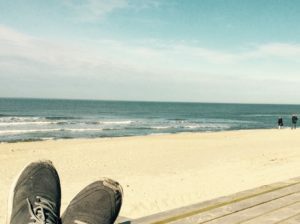 Es stimmt, wenn ich auf einer Nordseeinsel bin, bin ich gleichzeitig auf allen anderen Inseln und anderen Zeitzonen (der Junge, der Jugendliche, der Verlobte, old times, buddies!). Das passiert in der flüchtigen Turbulenz von Erinnerungen, die entweder sanft mitschwingen, oder auch das Schwelgen in einem konkreten Moment erlauben (going, gone, gone). 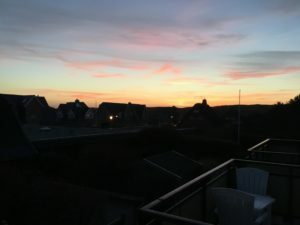 In dem rausgeputzten Zimmer, in dem ich schlafe, sehe ich eine akkurate Fotografie von drei leeren Strandkörben: dieser Raum füllt sich unmittelbar im Zickzack von Flashback und Fantasie. Jetzt schaue ich aufs Meer hinaus, und denke an das Cover von Ralph Towners „Diary“. Aus einem Transistorradio, am Meer, im Regen, auf Wangerooge, hörte ich einst, wie Michael Naura „Nimbus“ auflegte, aus dem Album „Solstice“. Ein quäkiger, dünner Transistor-Sound, und ich war hin und weg. Abends im Bett lausche ich, nach längeren Aufenthalt in Tom Franklins „Krumme Type, Krumme Type“, einmal mehr, Brian Enos „Music for Films“, und frage mich, wieso das eigentlich für mich eine der schönsten Platten der Welt ist. “ … We were in a hotel. A bit worn down. A memory of better days. Where I don’t know, perhaps it was in Sylt? I haven`t been there yet so I don’t know. I recognized Michael of course and there were other people (whom I had not yet met, but I understood they were the other Manafonistas – perhaps Jochen, Gregor, Martina or Marcus – there were no individual identities that I could separate from each other, just an identity as a group). We (perhaps Uwe, Wolfram, or Lajla – again there were no individuals – just shadows bleeding into each other) were sitting around a big table in a room with very a strong light. White and strong. The food was being served – cut into small cubes. There were no cutlery – no knives or forks. And nobody seemed to get the idea that it was possible to eat without knives and forks. We (or maybe Henning or Jan or Ian – or rather a creature consisting of us as if we were one) started looking everywhere, but the only cutlery we found had been dipped in paint or so broken that we couldn’t use it. As I woke up this morning the dream still lingered in me. And it is still lingers on, and I have the feeling having met you – the other Manafonistas – already. What it means that we could not eat our food (cut in small cubes) without cutlery or that we didn`t find anything suitable when we were looking for it I don’t know, neither that the plates with our food were gone when we were back from our search. I usually do not remember my dreams so clearly, and also during this dream I remember the feeling of knowing that I am dreaming. I feel I dream so much with my eyes open, that I prefer to not use my dreams as source of creation, whether it is with sounds or images or words. As I am writing right now – the dream mixes with the sounds of Daniel Lanois Flesh and machine – that I have played quite a lot the last days. Or have I? Is it rather that it is a record that was already playing inside me, and I have just needed someone to record it for me to recognize it? And it happened to pass thru Daniel? Flesh and Machine does feel like home, in a quite unexpected way. Flesh and Machine grows on repeated listening, and also when i am just trying to remember the sounds (without playing it, like just before going to sleep or just after waking up) and it has a lot of the same effect on me, as visualizing Stalker by Tarkovskij or the playing of Coltrane, whose record Live at the Temple University has been equally a revelation this week. But that is another dream waiting to dream me.